aving successfully negotiated the challenging regulatory slopes of the U.S. Bureau of Land Management, the U.S. Forest Service, the U.S. Department of Energy, and a host of Oregon state agencies, the Newberry Enhanced Geothermal Systems (EGS) demonstration project is in the process of creating a new geothermal reservoir in central Oregon. The core of the new reservoir is a two mile (2.7 km) deep well drilled about four miles (5.4 km) from the center of Newberry Volcano. The rock surrounding the wellbore reaches temperatures in the order of 600° F (300° C), and is nearly impermeable to water. That, however, is about to change. Newberry Volcano is one of the largest and youngest volcanoes in the United States. Having last erupted about 1,300 years ago, it consists of over 400 individual volcanic vents, which, when combined, form a broad mounded landform referred to as a shield volcano. The Newberry EGS Demonstration geothermal reservoir is being formed in the high-temperature, low-permeability deep lava of the volcano’s northwest flank. The Newberry EGS demonstration is the largest project funded to date by the DOE Geothermal Technologies Program. The DOE has granted over US$20 million to the project, an amount being matched by a partnership between AltaRock Energy and Davenport Newberry. The goal of EGS is to produce electricity by extracting energy from the earth’s heat. To accomplish this, a subsurface system of fractures is formed in hot, impermeable rock, and water pumped down from the surface is circulated through these fractures and returned to the surface as the energy source for a geothermal power plant. 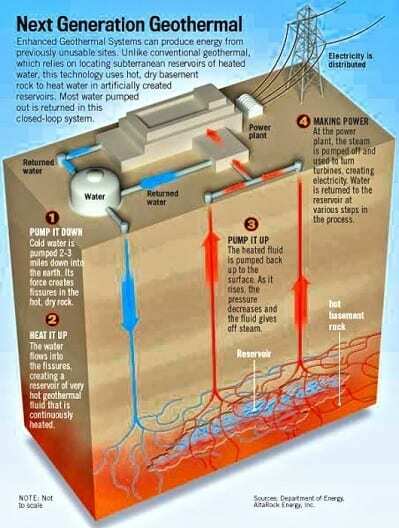 The starting point for creating a new geothermal reservoir is a deep well into hot, dry rock. Well NWG 55-29, drilled by Davenport Newberry in 2008, is well suited as the foundation for a geothermal reservoir. It is 10,060 feet (3070 m) deep into hot rock with very low water permeability.